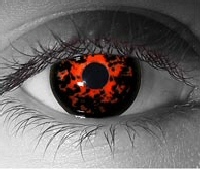 Make an impression with Halloween Color Contacts, weird and wonderful contact lenses that are sure to turn heads. Colored contact lenses are SO fashionable right now. The stars use them to cleverly change their look either by popping in a pair of color enhancing lenses to acentuate their own eye color or by transforming their eyes with a completely different color shade. Seeing how a simple eye color change can make a dramatic difference, it's small wonder why Halloween color contacts are a hot item in the run up to October 31st. Here are some ideas for crazy colored contacts for Halloween. Whether you want to look like Dracula with blood red eyes, a raving zombie with spiral effect lenses or you just want to have some fun with lenses that glow in the dark I've found some great Hallowen contact lenses to make a big impression. These lenses are all FDA-approved so provided you follow the correct wear and cleaning procedures, they will not harm your eyes. AND if you order through Vision Direct on one of the links below, you can get a whopping 25% off using coupon code NEW25VISION! Available in plano (zero power) form only, these psycho lenses with an eerie spiral effect have a base curve of 8.6 and a diameter of 14.5. Simply mesmerising. If you have a very low prescription eg. -0.25 or -0.5, you can probably get away with wearing a zero power lens for one night. or just choose one of the prescription Halloween lenses below. Available in plano (zero power) and prescription from -0.25 to -6.0, these crazy red and yellow lenses are sure to impress and have a base curve of 8.6 and a diamter of 14.5. 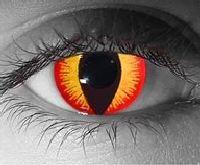 These spectacular red and black Halloween color contacts look like you've just stepped out of a cauldron. Available in prescription and plano form. They are more expensive as they are hand-made and come in 2 different base curves (8.4 and 8.6) and have a diameter of 15.0. At $104.99 PER lens they're not cheap but they are much cheaper than sclera contacts that cover the entire eye. 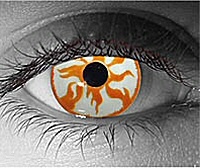 These awesome Pyro Contact Lenses are so cool with flames coming from the center of the eye. Allow 4-6 weeks for delivery as they are custom made to order. Available in prescription form from +4.00 to -6.00, they come in 2 different base curves (8.4 and 8.6) and have a diameter of 15.0. NB: Most $29.99 lenses are only available in MINUS prescription form ie. for short-sighted people like me, whereas these more expensive contacts, come in PLUS prescriptions too so you can wear them if you're long sighted aswell. 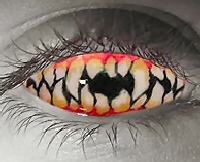 These Halloween color contacts are some of the most expensive on the market as they are intended for theatrical use and are custom made to order. These sclera lenses are much wider in diameter (22.0) as they cover the entire eye and take some getting used to. Both plano and prescription options are available from -0.25 to -6.0. You may need to take out a bank loan to afford the $479.98 that a pair of these will cost but they are sure to make a huge impression! Tip: Don't forget you can save $119.99 on a pair of these incredible lenses by using coupon code NEW25VISION at the checkout. That brings them down to well under $200 per lens. If you're looking for different discount Halloween contact lenses see the related pages below, but do remember that cheap lenses may be of inferior quality and you can really only be sure of quality if online optical retailers have FDA approval for selling crazy colored contacts.